Rob Wildhide will become a celebrated novelist; he just knows it. But first, he’ll have to overcome writer’s block and survive a wayward trip to the North Woods of Maine with his new bride, Annie, and her treacherous friends (raft guides are not to be trusted!). A love story at its best and wild ride at its drunkest, Relapse careens through shaman-led weddings, car heists that lead to strange prophesies, and the inner workings of a mind rife with possibility and absolutely unaffected by the moonshine, thank you very much. Is it relapse, or is it revival? Rob Wildhide will try just about anything to find out where this story goes. 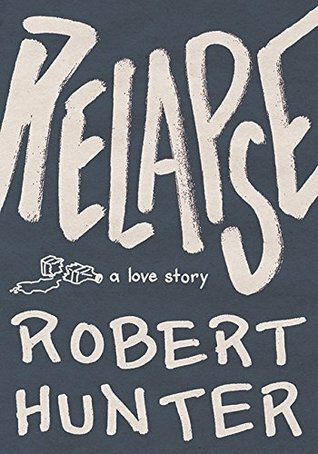 Relapse is a novel that sounded wonderful as a concept but didn't quite come together. I loved the idea behind the piece; however, its telling became convoluted and verbose, and I simply never came to care about any of the characters, including Rob, the 'hero' of the piece. The jumps back and forth between events were sometimes a bit obscure, so it took a few sentences to realise we'd changed time and place again. That said, the concept was interesting, and I appreciated what the author was trying to create, so I am pushing what would have been a 2.5 star review to 3 stars for the novelty factor, since the storytelling style is something a bit different.